At Everything Dinosaur, it is always a pleasure to hear from our customers. We get sent lots of photographs of customised models, collectors having taken a model and given it a unique paint job. Sometimes subtle changes are made to the body plan as well. Take for example, Elizabeth who is a long-time collector of prehistoric animal replicas. 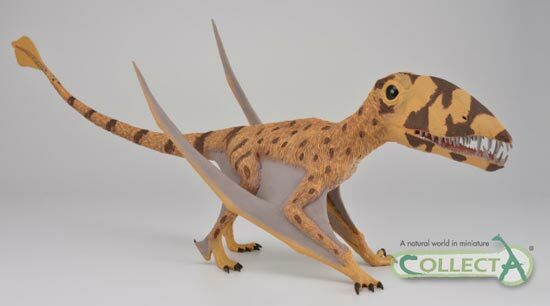 When CollectA introduced a large replica of the flying reptile Dimorphodon, Elizabeth jumped at the chance of acquiring it and then commissioned talented model maker Martin Garratt to re-paint the Pterosaur, providing her with a marvellous centrepiece for her model collection. A repainted CollectA deluxe Dimorphodon replica. Dimorphodon is known from the Early Jurassic of England (fossils found at Lyme Regis by Mary Anning) and a second species has been described from Mexico. It was a member of the Rhamphorhynchoid “Ram-for-rink-oid” Pterosaurs, a sub-order of the Pterosauria characterised by their long tails, with most genera having teeth but lacking a bony crest. The term Rhamphorhynchoid helps to distinguish early Pterosaurs from later forms (Pterodactyloidea), although the term is beginning to fall out of favour with palaeontologists due to the difficulties of defining newly described Jurassic species using this grouping. With a wingspan of around 1.4 metres and weighing approximately 1.5 kilogrammes, this Pterosaur was no giant and many early illustrations of this flying reptile placed it in a coastal environment, however, a number of scientists including the eminent Pterosaur expert Dr Mark Witton, have suggested that this strong-legged, big-headed fellow was probably more at home in forests away from sea. A closer view of the beautifully painted snout. Measuring a fraction under thirty-eight centimetres in length the CollectA Supreme Deluxe Dimorphodon (part of the CollectA Deluxe Prehistoric Life Collection), is a strong candidate for customisation. The model even has an articulated lower jaw, making access to the inside of the mouth easier for painting. The sands and browns of the original paint scheme have been replaced by much more dynamic and vibrant palate in Martin’s interpretation. The “leopard spots” have been replaced by “tiger stripes” and the finished repainted model is superb. We at Everything Dinosaur are also great fans of John Sibbick’s amazing artwork. Team members were asked to write the press releases that accompanied the Royal Mail British prehistoric animal stamps that John was commissioned to paint. The Dimorphodon illustration has been reproduced on numerous occasions, to illustrate both Dimorphodon macronyx and the sub-order of Pterosaurs as a whole. For example, the Dimorphodon painting that inspired the colour scheme on the CollectA Dimorphodon can be found on page 172 of “The Concise Dinosaur Encyclopedia” published in 2004 by Kingfisher. Dimorphodon male and female by John Sibbick. The picture above shows the John Sibbick artwork, the Dimorphodon on the right of the image is probably a male, the repainted CollectA model has been inspired by such illustrations and the resulting figure after Martin Garratt’s makeover is a truly unique and stunning model. The repainted CollectA Dimorphodon replica.